There’s nothing like writing on dry erase boards and I’m happy to say I have recently acquired one (with staff lines!) for my studio wall. Another studio essential for many years: the Hal Leonard All-Purpose Music Flash Cards–if you don’t have ’em, you might want some. However, an app called Multitouch White Board discovered a while ago, serves the same purpose and SO much more. As you may know, Piano Anne, Susan Paradis and others generously share their helpful pdf worksheets and tools at their websites. It is no surprise that both Anne and Susan have employed the iPad to promote and extend the use of their dedicated efforts. In a nutshell, with the White Board and Skitch apps, their pdfs and/or customized backgrounds can be completed over and over on the iPad without using expensive ink or paper. Already back in 2011, PianoAnne offered instructions on how to download her custom-designed backgrounds for the White Board app. Using a convenient Dropbox link, it is so easy to transfer them into the app (click here to learn more). To the left you’ll see a screen shot of one of Piano Anne’s backgrounds (tracing flat key signatures) loaded onto my iPad. 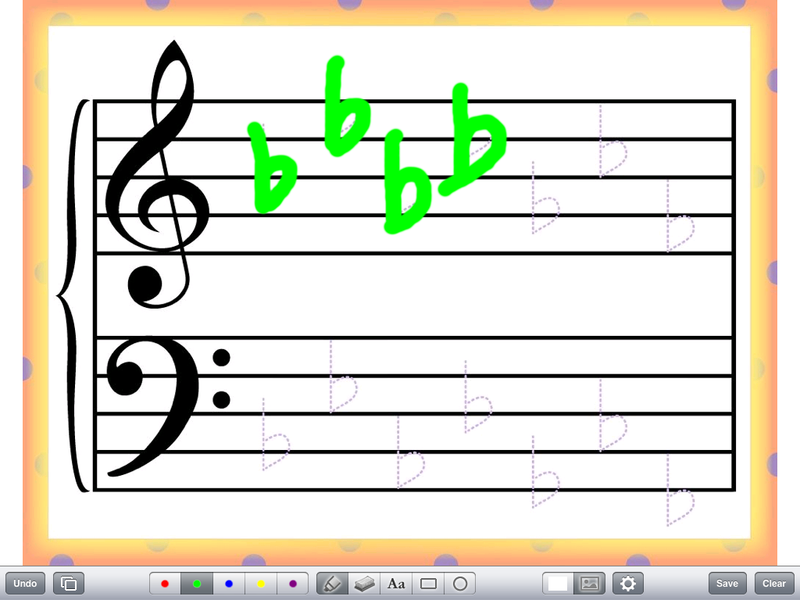 Recently, Susan Paradis shared how to view and use her worksheets with Skitch. Click here to see her easy-to-follow instructions. NOTE: Susan’s worksheets work with the White Board app as well. Inspired by their ideas, I recently created a pdf of a home-made lead sheet, took a pic, and loaded it into Skitch. 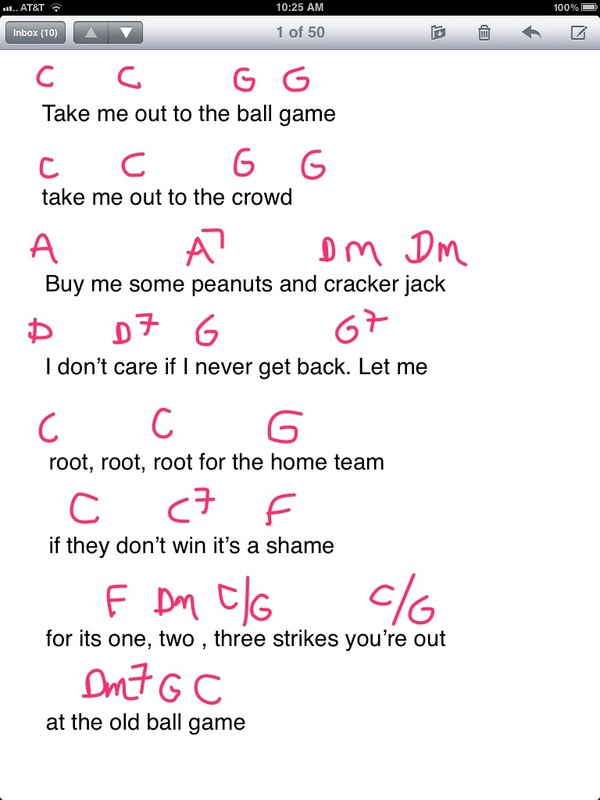 During lessons the adult student (who owns an iPad) and I will be writing in new chords as the piece develops into a ragtime version of “Take Me Out to the Ball Game”. 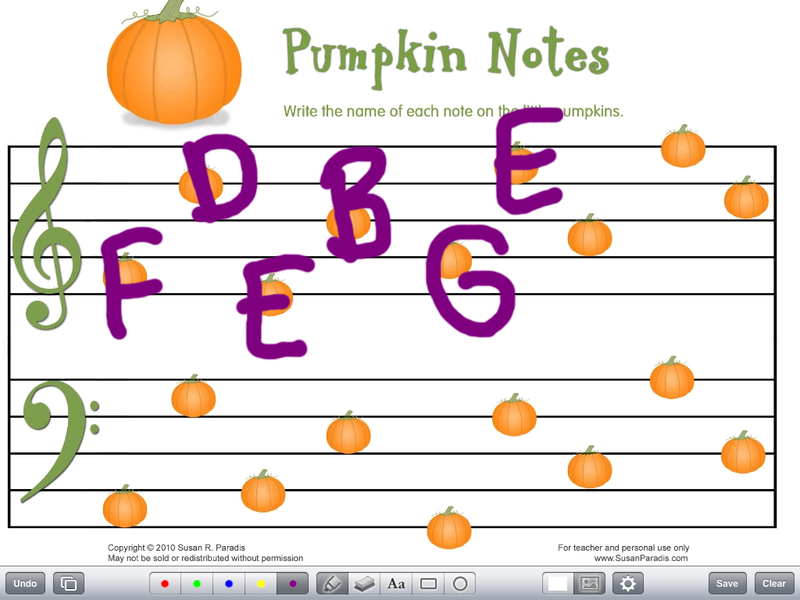 Skitch allows us to write in the chord plan but erase and substitute new chords with ease. At the end of the lesson, the final copy can be emailed to the student for home practice. Tip: you may want to use a stylus to write on the screen. A little bit neater than a finger. One way I instruct my students to master note recognition on the grand staff is to use sentences such as “Elvis’s Guitar Broke Down on Friday” or “All Cows Eat Grass”. In honor of the pumpkin season and knowing my students could use a review of note names and theses sentences, during lab time, they were asked to write in note names on the Pumpkin worksheet crafted by Susan Paradis. When I learned how to take a screen shot on my iPad, it occurred to me that this could be handy but wasn’t sure quite how. Thanks to Piano Anne and Susan Paradis, it turns out this capability could be one of the best ways to keep lab assignments innovative with handy worksheets but resulting in fewer runs to the office supply store. If you were wondering how an iPad could be an advantage over an iPhone, here’s one more reason why you might consider it a worthy investment. It can not only be transformed into a white board/worksheet about the size of a standard 8.5×11, but it can also reduce your ink expenses and keep your studio “green”. Honestly, what happens to most worksheets after completion, they’re tossed, right? Application Potential: 5/5 The unlimited versatility of this app is phenomenal! Ability to Use with Ease: 4/5 Once you learn how to load the photos, you will wonder what you ever did without this. One drawback, the marker size is a little bulky, it would be nice if the tip could be reduced to a finer tip. Assessment of Investment: 5/5 $1.99 is less than my Starbucks Grande drip coffee. Application Potential: 3/5–this will be very useful for teaching, presenting, creating, and more. However, I think I’ll still use the White Board app a little more, just easier to use. Ability to Use with Ease: 4/5 The app was recently updated and I need to adjust to the format. It seems to be less friendly for youngsters than the White Board. You can manage the marker tip size, unlike the White Board app. Previous postHow Can Paper Clips Prepare for Positive Performances?